Cunard celebrated the Diamond Jubilee in style with the single-file sailing of three cruise ships into Southampton port. 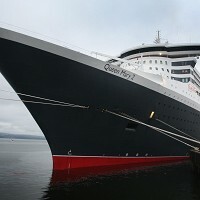 A flotilla of small boats and a fire tug greeted the Queen Victoria, Queen Mary 2 and Queen Elizabeth and as the cruise ships approached City Terminal, they created a three-bow formation. The ships sounded their whistles and the crew took to the decks. The ships' performance was part of a day of celebrations for the Queen's 60-year reign, with the events also including live bands and other first-rate entertainment. The celebrations showed the kind of pomp and prestige people can expect from a cruise, however when booking such a trip it's important to remember cruise travel insurance as well. A Cunard spokeswoman said: "Today was all about the opportunity for the three Cunard Queens to celebrate Her Majesty and her Diamond Jubilee. "Cunard is proud of its association with Her Majesty and we are delighted to be able to honour her on this special day. It brought a lump to the throat when you saw these three magnificent ships together. "There were crew out waving flags and lots of noise and there was a real positive spirit. It was a really special moment."